Create a smaller sized sink with a one-of-a-kind look using our beautiful design ideas for your bar or for your cooking preparation area in the kitchen. Bar sinks are a smaller alternative to a full size sink for your wet bar to save space. Prep sinks are usually installed by the cook top or on an island countertop. They are typically for washing, cutting, and preparing vegetables. It is usually a good idea to have a garbage disposal attached to prep sinks. All of our sinks can come in a living finish, be waxed included in price or have a clear coat added for an extra charge. We recommend a clear coat for bar and prep sinks, any wax will wear away quickly in a sink that is used mostly for certain fruits and drinks. Our copper bar and prep sinks are available in many different sizes and shapes and are available in hammered or smooth copper and/or any of our patina options. Our copper specialists can help you choose the right size and style based on your cabinets and decor. 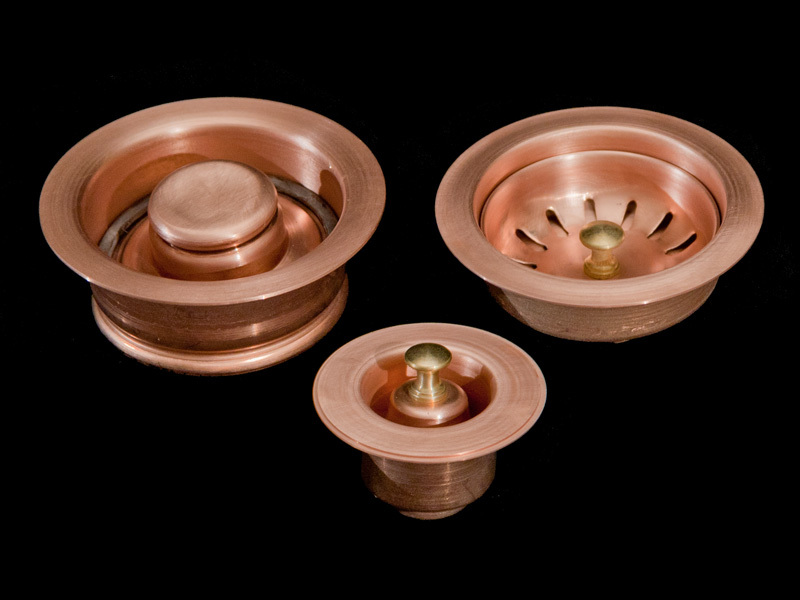 Our copper bar and prep sink drains are standard in two sizes a 2" and a 3.5" hole size. If you want a full size drain or disposal drain, then a 3.5" drain size is required. If you want the drain to take up less room and just drain water then the 2" hole size is needed. Feel free to contact us if the copper bar sink you have chosen needs a different drain size, we can accommodate any request. Circle City Copperworks handmade Bar and Prep Copper Sinks feature true craftsmanship, durability and enduring style. Copper is a beautiful and practical medium for your kitchen or entertainment room design. Our custom, to order copper sinks possess an eye catching look which is both stylish and unique. Enhance the beauty of your new bar or island with a copper bar or sink from Circle City Copperworks ! Please give us a call at 317-284-0687 for any custom ideas you may have, we will be happy to assist you. This is a Hammered Signature Series bar sink, with 1.5” rim around it in a under mount style. It is 15”x15”x7” deep. Pictured is a Medium Brown patina, regular hammered sink. We can make these in any custom size you may need. It has a standard 3.5” drain hole. We made this sink out of 48 oz. pure American copper. Contact Circle City Copperworks for any custom sizing at 317-284-0687. 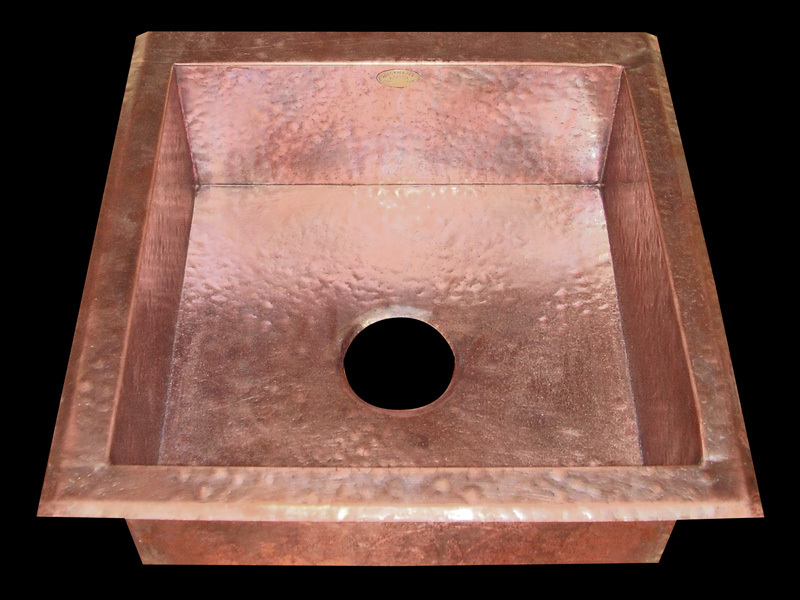 This Traditional copper bar sink shows a 15"x15"x7" inside dimensions with a 1.5" outer flange and 3.5" drain hole. This copper bar sink comes in any of Circle City's smooth or hammered finishes, with squared corners and sides. Pictured is a smooth copper sink with a Light Brown Patina. It is handmade in the USA from pure 48 oz. American copper. Please call us at 317-284-0687 for custom sizing options and pricing. This Picture is of a Traditional Series hammered copper drop in bar sink with no patina (bare finish). It is 15"x15"x7" inside dimension with a 1.5" outer flange and 3.5" drain hole. This copper bar sink comes in any of Circle City's hammered or smooth finishes, with squared corners and sides. It is handmade in the USA from pure 48 oz. American copper. For custom sizing options and pricing, please call us at 317-284-0687. 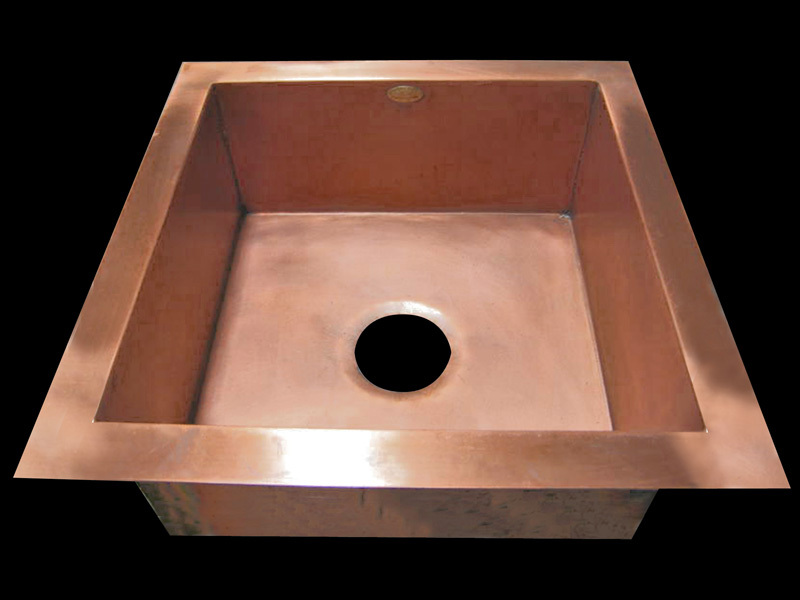 This Copper Prep Sink has a 15" inside diameter, 7” deep and is made with pure 48oz. American copper. This sink comes in smooth or hammered with a 2” or 3 1/2" drain opening. It is pictured in a Light Brown patina. 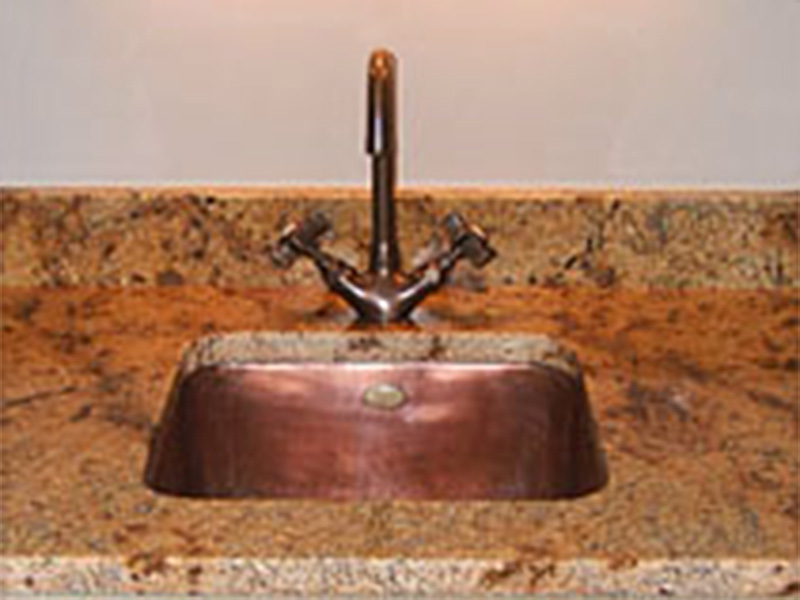 Copper prep sinks are available in various sizes and depths. It will have a small weld bead on the inside of the bottom. For custom sizing and pricing, please call us at 317-284-0687. Our drains are solid American copper and made by us. We can color these to match whatever patina you choose for your sink. The one on the left is the disposal drain and will fit Insinkerator® type units with 3 3/8" ID as well as most Kenmore® , KitchenAid®, Maytag® , Jenn Aire® , and select models of Whirlpool®. Will not fit Franke® Waste King, or Whirlaway® models. The right drain is our strainer drain, it comes with a PVC bottom for easy installation, these two drains can be used for prep sinks also. The smaller one in the front and middle is our smaller prep or bathroom sink drain. Drain price is $150 with a sink purchase only. Circle City Copperworks will add a classic look to your bar after installing our custom made copper bar sink. Above, you can see from our portfolio, the different types of copper bar and prep sinks, each seen are custom made by the finest standards. More home owners realize that copper bar and prep sinks are both beautiful and functional in any bar. New home owners install copper bar sinks to accentuate their bar's beauty, to add character to a room by installing a copper item. Copper bar sinks add class to any unique bar or recreational room when you select from our custom and pre-designed copper prep sinks. Choose today to remodel your bar or recreational room with one of our copper bar sinks!